50 of the BEST Summer Would You Rather Game questions for kids, tween and teenagers! 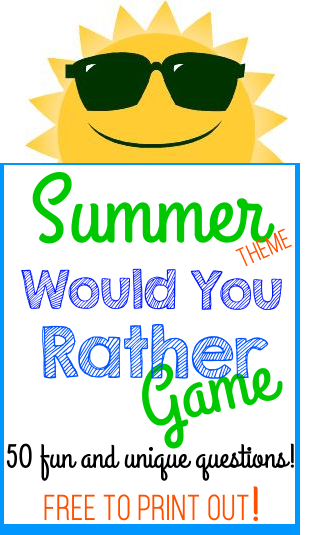 The summer version of the Would You Rather game is great for summertime parties, sleepovers, as a travel game in the car, train or plane and all types of group events. The group of kids (or adults!) are asked one question at a time. Would you rather ... A or B. The players must choose an answer between the two crazy answers that are given. Print out the free questions and let the fun begin! The game is easy to play and perfect for large or small groups. Print out the Summer Would You Rather Questions. Have one player ask the group questions one at a time. Players can answer the question at the same time. Variation: If the game will be played in a large room or outside designate one side of the room / yard for answer A and the other side of the room/ yard for answer B. When the players answer a questions they go to the side of that corresponds with their answer. This is a fun way to keep the game interactive and everyone moving. 1. Watch clouds in the daytime or stars at night? 2. Have starfish for hands or pink flamingo legs? 3. Have pineapples for hair or talk like a parrot? 4. Have a beach ball for a head or a snorkel for your nose? 5. Vacation on a crowded beach or deserted island? 6. Have lightning bugs for eyes or ladybug legs? 7. Go on a high rollercoaster or a high waterslide? 8. Run through grass or sand? 9. Build a campfire or build a sandcastle? 10.Surf in the ocean or kayak in a lake? 11.Have suntan lotion for hair or pool noodle arms? 12. Swim everywhere you go or The floor is lava? 13. Be in a parade or go on a treasure hunt? 14. Fly a kite or climb a tree? 15. Dive off the high diving board or do a belly flop? 16. Work at the Farmers Market or a Lemonade stand? 17. Blow 1,000 bubbles or fill up 100 water balloons? 18. Go to a baseball game or an amusement park? 19. Live in the zoo for a month or live in a museum for a month? 20. Lemons for eyes or sea shells for ears? 21. Run through the sprinklers or have a squirt gun fight? 22. Have garden hose legs or pinwheel arms? 23. Go camping for two months or Disney World for 2 days? 24. Play tag with eveyone you meet or jumprope everywhere? 25. Go horseback riding or watch a fireworks show? 26. Live in the woods or on the beach? 27. Eat only hotdogs or only ice cream for the summer? 28. Carry around 10 coconuts or 5 watermelons everywhere you go? 29.Find a message in a bottle on the beach or roast marshmallows over a campfire? 30. Wear sunglasses or a swimsuit everywhere you go all summer? 31. Pretend to do cannonballs everywhere you go or pretend you're on a slip and slide? 32. Snow cones or popcicles? 33. Have sand for skin or have sand shovels for hands? 34. Watch the waves at the beach or a thunderstorm from a cabin? 35. Have a palm tree or a suitcase for a body? 36. Make smores or feed the ducks? 37. Go fishing or build a huge sandcastle? 38. Carry a beach towel everywhere or a backpack? 39. Have sidewalk chalk for fingers or ice cubes for toes? 40. Outdoors in the sun or inside with a fan? 41. Carry a beach chair around for a month or an inflatable raft? 42. Make and serve lemonade to 500 people or hula hoop 50 times? 43. Sandles or flip flops? 44. Go to camp for 2 weeks or a small amusement park for 2 weeks? 45. Have sand pails for hands or beach balls for feet? 46. Learn to surf or go on a hot air balloon ride? 47. Stay in one resort for a month or travel across the country for one month? 48. Glow sticks for eyes or flashlights for arms? 49. Swim in a pool or ice or a pool filled with small beach balls? 50. Give sunflowers to everyone you meet or splash them with water?